You can change your life by using the principles of feng shui. This is the fundamental principle I read in Karen Kingston's book Creating Sacred Space With Feng Shui. It said that to first change your space you must unclutter your life at all levels and only then would the feng shui cures be effective. I read this book cover to cover in 1997 and from then on my passion for letting go of clutter never stopped. So there I was with my own clutter. I took myself on the journey of getting uncluttered and organized and I never looked back. I then became so passionate about this process of letting go and liberation that I eventually made this into my career as a full fledged professional organizer. In the organizing industry, getting uncluttered and organized is about slapping labels on boxes, purchasing the right containers and positioning your shoe collection nicely and neatly to look like a department store display. It has to look Pinterest-Perfect. When I put it like this, it seems exaggerated and yet still this is a common approach in professional organizing. The industry will also have you believing that it's about efficiency and functionality. And while I agree that both these lines of thinking are true and helpful, after 10 years of working with clients as a professional organizer and life coach, I find there is more to be gained from this process of getting uncluttered and organized than meets the eye. There is more to getting organized than this. Think of your clutter as a reflection of where you are right now in your life. The way it looks and feels is not a judgement, it is simply a snapshot of where you are currently. It's visibly showing you what's out of balance. This is your starting point. This process is about feeling and reaching simplicity, openness and joy. It's about gratitude for what you have, enjoying the things you revere with a certain care and pride and choosing to have those surrounding you. This includes people, things and situations. It's about consistency and self-care. By self-care I mean, that having and creating space for things in your life that reflect the best parts of you is, by default taking exquisite care of yourSELF. 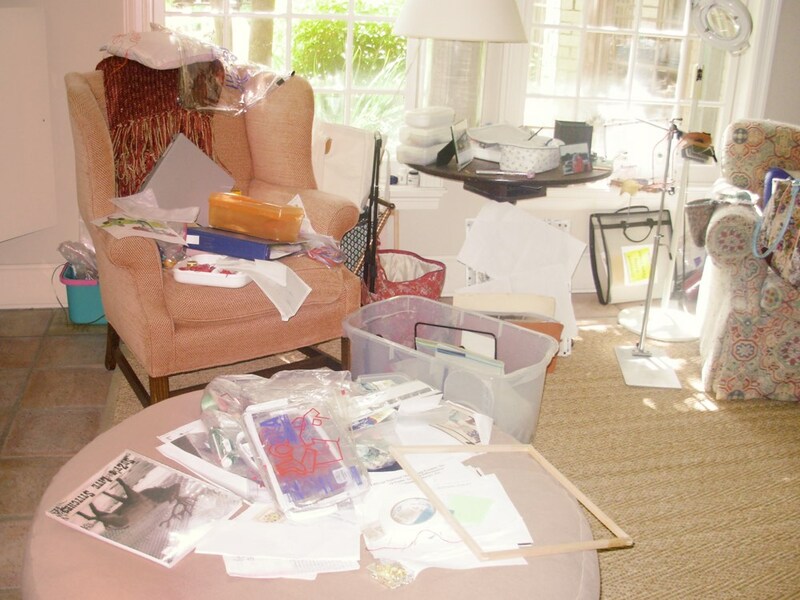 Have you ever considered that your clutter is one of the things that's in your way? It's in the way of you being your best self. My perspective of this cathartic process is that letting go of clutter is a gateway to activate change in any area of your life. Uncluttering is powerful. It gives you access, clarity and direction to whatever the "clutter" is covering. When things feel stuck or stagnant, how do you shift into someone who can frequently feel more ease and flow? You find the clutter and you let it go! The standard of uncluttered living is not equivalent to living in a sterile environment. It's all about being intentional and purposeful in that, everything you touch, deal with and manage in your life has a purpose. It serves you in some small or big way. It's there to serve you. That's it. It's not about keeping up with the Joneses or for you to be like everybody else. It's for you to live your life as fully as possible without having extraneous things distracting you and draining your attention. To live uncluttered, is to be completely intentional. Behind intention great things can happen. Just like being vegan is a philosophy of health that promotes cruelty-free living and just like yoga is encompassing breath and movement, it takes time and practice to cultivate. So is the process of getting uncluttered. It's a philosophy and a way of living. It's an organic process and mindset that you integrate little by little, piece by piece and it builds and keeps building upon every step you take. It is NOT a to-do list. Are there action items involved in getting to this point of uncluttered and mindful living? Absolutely. Are there goals you can achieve in getting there? Yes. Can you conquer your cloud of clutter? Yes, you can. The more curious and mindful you are about why the clutter is there, the more you can change the habits that got you cluttered in the first place. But once you are done with all the action, then you lean into everyday life and keeping things uncluttered becomes the mindful practice. When you tease out the clutter spots your mood will change, energy will flow, and things will shift. This is good! Some roads will part into a certain direction, and others will get longer. From here on out, you get to choose which open road to navigate. The road is now... uncluttered and open. I am passionate about everything related to uncluttering and I will continue to share with you frequently my insights here on The Huffington Post. Stick with me as we let some clutter go and have some fun! Interested in getting uncluttered? Work with Sofia online, visit A Life Uncluttered for more info.